I’m a proud product of—and champion for—public schools. My husband is a history professor at Texas State University and we’ve been married for 15 years. 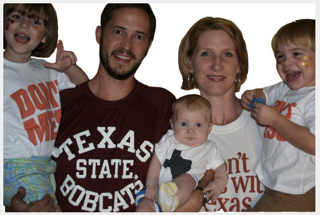 We’ve been in San Marcos since 2010 and we have three kids, two at Crockett and one at Miller. We love San Marcos and I am thankful to be able to give back to the community that has welcomed me, Jeff, and our children, with open arms. I have served as a At-Large Trustee on the SMCISD board since 2015, including two years as Vice President. My dad was a public school teacher and my mother was a public school nurse in Iowa, where I grew up. I’m a proud product of—and champion for—public schools. My husband is a history professor at Texas State University and we’ve been married for 15 years. We have three kids, two at Crockett and one at Miller. I’m proud of the progress we’ve made and of the direction in which our district is going. San Marcos CISD is a growing and increasingly exciting district because of the fantastic kids, as well as the highly-qualified educators who respect and work tirelessly for their students day in and day out. Our district works with our community to give students the resources they need to succeed at top-level colleges and universities and to go on to work in rewarding careers, while giving back to society in so many positive ways. In the past few years, the district has succeeded in promoting the health and wellbeing of the whole child, taking steps not only to encourage academic learning, but also to teach students to take responsibility for themselves and their community. We have hired a wonderful new superintendent and central administrative team, we’ve lowered class sizes, raised teacher and staff wages, and overwhelming passed a major bond to build critical new classroom space, all while returning money to the fund balance, paying down our debt, and not increasing the tax rate. Recently, the district has also advanced new initiatives to improve our Special Education, Gifted and Talented, and English Language Learners programs. We’ve created a successful new Dual Language program, added counselors and social workers, made our high-quality full-day preschool more accessible, increased the Career and Tech course offerings, and focused on rigor and academic achievement at every level. We can always do more to prevent kids from falling through the cracks, but these programs work together to build student ability, skills, and self-knowledge before problems arise. Going forward, I want to continue to decrease class sizes at all levels—and specifically in secondary math and English classes—in order to provide every student with the one-on-one instruction necessary to master these crucial subject areas. I have the professional experience to continue helping our schools – and our students – grow. I have considerable professional experience in the corporate and non-profit sectors, and much of my professional career has been focused on supporting significant educational initiatives. I am a strategist, a planner, and a negotiator. Prior to becoming a stay-at-home mom, I was on the senior staff of a national literary organization where I directed a multi-million dollar initiative to expand the presence of poetry in the media. I also worked at the University of Illinois at Chicago, conducting policy research and coordinating the activities of the Dean’s office. I got my start in the business world directing and implementing marketing campaigns for several cable networks, including Bravo TV where I managed a $12 million budget. I currently serve on the San Marcos Education Foundation, the San Marcos Commission for Youth and Children, and the Early Childhood Coalition of Hays County. I previously served on the San Marcos Historic Preservation Commission, the Board of Directors of the Presbyterian Parent Cooperative Preschool in San Marcos and was a member of the Local School Council in Chicago. I graduated from Macalester College and received my MFA at New York University. I believe the well-being of my family depends upon the prosperity of our community and the success of our public schools. As your board member, I will act with the same integrity, common sense, creativity, fairness, and respect that I give my own family.